After surgery on both of his knees in 2016, Zach Eflin entered Phillies camp hoping to work his way back into the major league rotation in 2017. CLEARWATER, Fla. – Even though he had the first of two surgeries, one on each of his knees, in late August, Zach Eflin began his throwing program earlier than in any other winter this offseason. He threw a bullpen session, his third since arriving in Clearwater, Fla., on the day pitchers and catchers held their first official workout of the spring on Tuesday. Eflin is on pace with the rest of the large contingent of starting pitchers in camp, which is a good thing for the 22-year-old because this is the wrong camp to hope to play catch-up. As long as everyone is healthy – which is a caveat that shouldn’t be discarded, given the fragile nature of pitchers in general – Pete Mackanin arrived in camp with his five-man rotation in place. Clay Buchholz, the former top Red Sox prospect who is a year away from free agency, joins the incumbent foursome of Jeremy Hellickson, Jerad Eickhoff, Aaron Nola, and Vince Velasquez. If those five break camp healthy, four pitchers who made a combined 47 starts for the Phillies in 2016 (Eflin, Adam Morgan, Jake Thompson, Alec Asher) will begin their 2017 seasons accepting demotions. Other than Morgan, who could shift into a bullpen role, they’re likely to begin the season competing for a spot in the equally competitive Triple-A Lehigh Valley rotation with Ben Lively, Nick Pivetta, Ricardo Pinto, and Mark Appel, who are also all in major league camp this spring. If manager Pete Mackanin has the five starters written down in ink, is it possible he also has a favorite for a so-called sixth man or a first man up from Triple-A? Which would seem to make for a pretty uncertain spring for the majority of pitchers in camp. Again, a lot can happen. Eflin begins camp coming off an uneven rookie season. He threw two complete games (including a three-hit shutout in Pittsburgh) in two of his 11 starts with the Phillies. But he also allowed six runs or more in four of those 11 starts. Three of those latter outings were his final three starts of the 2016 season … just before he was shut down in early August with patellar tendinopathy in both of his knees. The good news for Eflin, a former first-round pick by the Padres who arrived in the Jimmy Rollins’ trade, is that he made a favorable impression on at least one of the people who will be making decisions this spring and summer. Eflin dealt with knee issues for more than a decade. After a pair of surgeries that took place less than two months apart, he’s pain-free. It’s uncertain where he’ll land when the beginning of April rolls around, but he’s put himself in a position to be where he was last May: as the first pitching prospect called up when there was a vacancy in the major league rotation. His surgically repaired knees should allow for more strength and durability this summer. 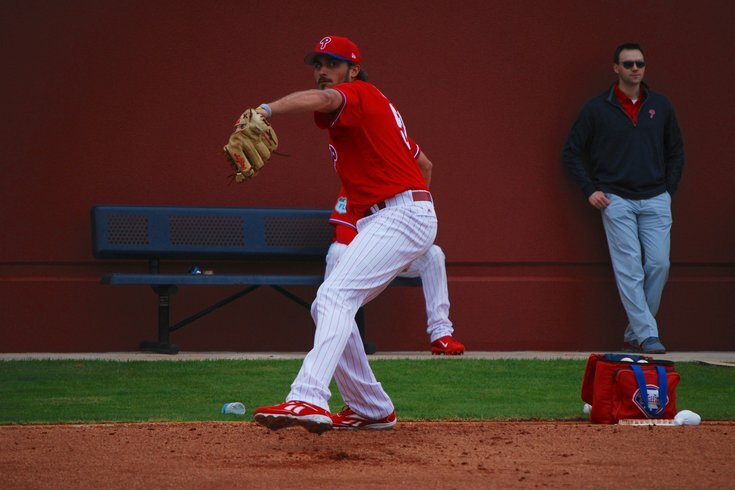 Victor Arano, a right-handed reliever who could follow the path of Hector Neris and Edubray Ramos from the farm to becoming a pivotal member of the Phillies’ bullpen this year, might not get the chance to make an impression this spring. Arano has been shut down with elbow tenderness and underwent an MRI on Thursday. Arano, who turned 22 earlier this month, struck out 95 batters and walked only 19 in 79 2/3 innings (46 games) between Double-A Reading and Class A Clearwater last season. Arano arrived to the Phillies (with infield prospect Jesmuel Valentin) in the Aug. 2014 trade that sent Roberto Hernandez to the Los Angeles Dodgers.